Wade Young is set to defend his Motul Roof of Africa title on the back of arguably the most successful competitive year by any South African sportsperson, in any discipline. 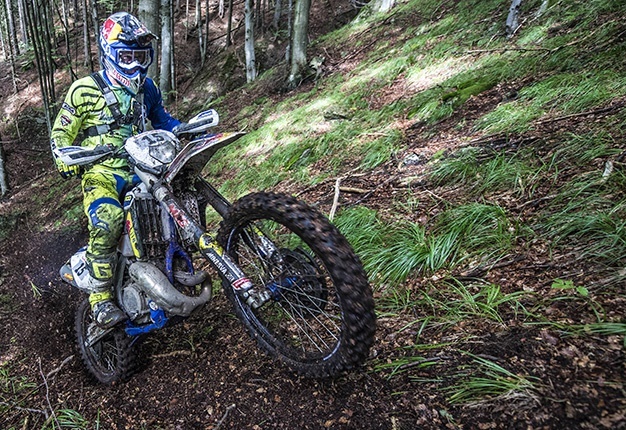 The KwaZulu-Natal-born enduro racer won three of the major global hard enduro events this year, taking out Red Bull Romaniacs, Red Bull Megawatt 111 in Poland and Sea to Sky in Turkey, among a string of other podium results. It is a results list unmatched by any other South African athlete in 2018, and yet in his home country, he remains relatively unknown. The 22-year-old, who races for Sherco Factory Racing first stormed to prominence in 2012 when, at age 16, he became the youngest racer to win the Motul Roof of Africa – the iconic motorbike enduro race known as 'the mother of hard enduro’. In 2014, his third attempt only at the event, he took his second title and in 2017 he outgunned a world-class international field – including the legendary Graham Jarvis, Alfredo Gomez, Manuel Lettenbichler and Mario Roman to win his third. Now he’s looking to finish off his huge year on a high. And, even though it is an all-South African field this year, he is under no illusions as to the challenges at hand over the three-staged event which will test the grit of both man and machine on the technical mountainous trails of Lesotho. "There is something about Lesotho that’s really cool and I enjoy riding here. It’s my 'home' event and it’s really brutal - just getting to the finish is a challenge," said Young. "Also, it is kind of where it all started for me, so coming back is always special," he added. According to Young, he is feeling a degree more of outside pressure going into the event, after the successful year he’s had and because he is the defending champion. But he is not letting it affect him. "I treat every race as a big race and I have the same mindset going into each one," he said. "People do have a lot of expectations of me but I put that aside and don’t underestimate anyone going into this coming weekend, even though it is only South Africans riding this year. "Travis (Teasdale) was second last year and we had a good battle all the way to the end - he was better than all the Europeans when they were here, so that doesn’t mean it is going to be an easier race. My brother, Kyle Flanagan, is riding well so I am definitely not writing anyone off," Young said. According to Young, other riders to watch in the all-South African battle are Altus de Wet, Blake Gutzeit and Scott Bouverie. Rumour has it that the route will be ‘much’ tougher than in 2017, with some riders who have recce’d the new route predicting tough navigation and seven-hour days for top riders on both Friday and Saturday. The majority of this year’s route made up of virgin trails around the Ramabanta area of Lesotho, which will no doubt make for seriously challenging racing. The event also features a brand new start and finish venue this year, at St. Andrews School in Ha Raboletsi, (approximately 55km from Maseru). I'm a 48 year old man looking to meet women between the ages of 35 and 44.